"The Walking Dead," has of course been an immensely popular comic that had a smash-hit television show adapted of it (with spin-off show, "Fear the Walking Dead," being popular too). Besides comics and television there have been video-games that have varied in quality from amazing to terrible, as well as countless merchandising tie-ins. That said, I think right now the property is starting to milk itself dry. Perhaps this is a result of some panic by TWD co-creator Robert Krikman, AKA the man who gets all the credit for the comic despite screwing-over Tony Moore until they settled a lawsuit. This panic of course might relate to how so many actors are leaving the main show in the near future and the comic is getting less and less buzz over the years. Hence, suddenly the timeline to capitalize on the popularity of all things TWD is getting shorter and Kirkman needs to milk that cow, baby. 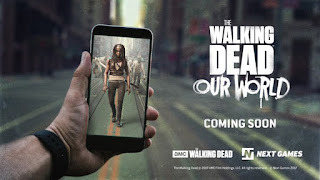 So now we've got the creation of, "The Walking Dead Day," 15th anniversary store variants, and a Pokemon Go-styled mobile game? I mean, what's next, an officially licensed cookbook and oh wait that exists. God, Kirkman really is squeezing every cent out of this property he can, isn't he? I don't know, perhaps the fact I was never a huge fan of, "The Walking Dead," besides enjoying some of the Telltale-created video-games is why I'm so cynical about all this. If I were a die-hard fan of the comics and/or television show I might want to buy everything related to the property I could. It just is starting to feel more and more like TWD-mania is starting to die-down and while the comic might continue for some years and the television show may even keep going for a bit, this is a property that is past its peak years of popularity. I could be wrong and some kind of resurgence happens, but I'm gonna go more with my thinking Kirman is running about of ideas and trying to make as much cash as possible than optimistically assuming things are only going to get better from here on out.